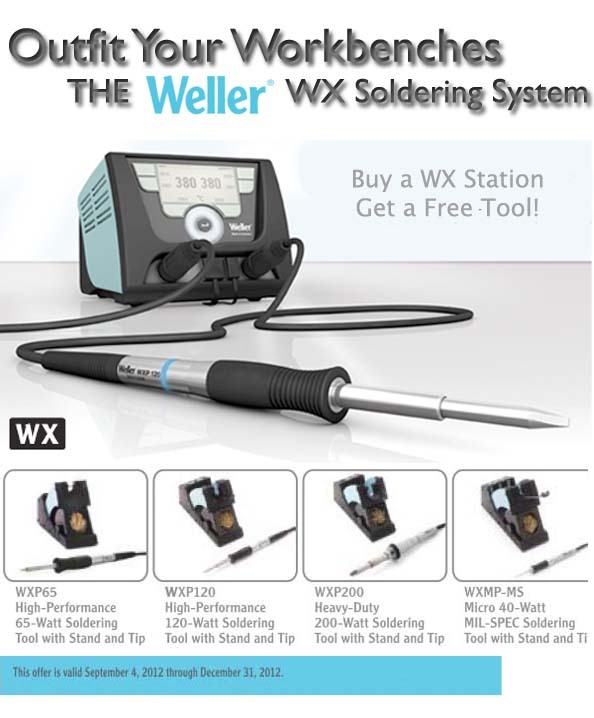 Janel Online is pleased to announce a new promotional opportunity to help your soldering needs with our popular Weller WX soldering station series. With this promotion, the end-user will get a free accessory (WX soldering pencil or rework tweezers) with the purchase of each WX soldering system. The free accessory includes the soldering stand and a tip. Use this exciting opportunity to help build your soldering station tool kit! To shop all Weller products visit us online. Janel Online is proud to be an authorized distributor of Weller Soldering. JanelOnline.com is the largest woman-owned, single location stocking distributor for Kester Solder products. We specialize in Soldering and Desoldering materials and tools, ESD products, Hand Tools, Packaging, Adhesives, Magnification, Cleaners, and Safety supplies, and are the source for all of your production assembly requirements. Copyright 2012 | Janel, Inc. Powered by Blogger.